At Cranberry Creek Farm we breed ADGA registered Alpine Dairy Goats and make hand crafted farmstead goat cheese. Our cheese is inspired by popular French cheese but we also serve up a hearty portion of homegrown flavors and Pennsylvania style. We use vegetarian rennet for all of our cheeses, and we prepare a house made starter culture for the aged raw milk cheese. These cheeses embody the flavor of our 5th generation family owned 100 acres in Paradise Valley, PA. Registered American Alpines browse on rocky hillsides of blueberries, oak coppice and brambles or graze intensively managed pasture paddocks. The ecosystem of the farm is superb for dairy goats, and we believe it shows in the vitality of our lovely ladies and in the ethereal flavors of our cheeses. We have been raising quality registered Alpine Dairy Goats since 2011. Many of our does are directly related to top 10 milkers. 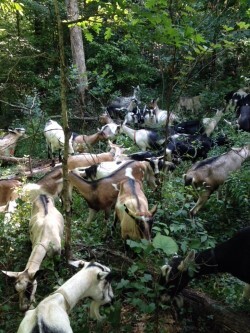 We graze our goats on rotated pastures and woods. They receive a non-GMO grain at milking time and they also have free choice access to 12 different mineral supplements every day. In the winter they eat hay made on our farm or close by, and non-GMO grains. All content property of Cranberry Creek Farm. 112 Henry's Crossing Rd, Cresco, PA 18326.